For the North American use of the term, see Townhouse (North America). For the Scottish use of the term, see Seat of local government. In British usage, the term townhouse originally refers to the town or city residence, in practice normally in London, of a member of the nobility or gentry, as opposed to their country seat, generally known as a country house or, colloquially, for the larger ones, stately home. 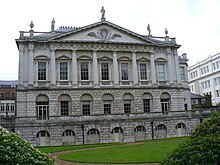 The grandest of the London townhouses were stand-alone buildings, but many were terraced buildings. British property developers and estate agents often market new buildings as townhouses, following the North American usage of the term, to aggrandise modest dwellings and to avoid the negative connotation of cheap terraced housing built in the Victorian era to accommodate workers, see Terraced houses in the United Kingdom. The aristocratic pedigree of terraced housing, for example as survives in St James's Square in Westminster, is widely forgotten. 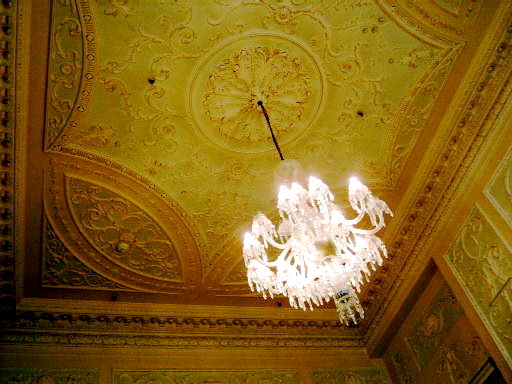 The term is comparable to the hôtel particulier, which housed the French nobleman in Paris. Historically, a town house was the city residence of a noble or wealthy family, who would own one or more country houses, generally manor houses, in which they lived for much of the year and from the estates surrounding which they derived much of their wealth and political power. Many of the Inns of Court in London served this function, for example Gray's Inn was the London townhouse of Reginald de Grey, 1st Baron Grey de Wilton (d.1308). From the 18th century, landowners and their servants would move to a townhouse during the social season (when balls and other society gatherings took place). From the 18th century most townhouses were terraced; it was one of the successes of Georgian architecture to persuade the rich to buy terraced houses, especially if they were in a garden square. Only a small minority of them, generally the largest, were detached; even aristocrats whose country houses had grounds of hundreds or thousands of acres often lived in terraced houses in town. For example, the Duke of Norfolk owned Arundel Castle in the country, while from 1722 his London house, Norfolk House, was a terraced house in St James's Square, albeit one over 100 feet (30 metres) wide. 1593 Norden's map of Westminster shows and names many grand London town houses on the Strand: Yorke House, Durham House, Russell House, Savoy Palace, Somerset House, Arundel House, Leicester House, all downstream from Whitehall Palace. Lambeth Palace is marked as "Lambeth Howse"
In the Middle Ages the London residences of the nobility were generally situated within the walls or boundary of the City of London, often known as "Inns", for example Lincoln's Inn was the town house of the Earl of Lincoln, Gray's Inn of the Baron Grey de Wilton. They gradually spread onto the Strand, the main ceremonial thoroughfare from the City to the Palace of Westminster, where parliamentary and court business were transacted. Areas such as Kensington and Hampstead were countryside hamlets outside London until the 19th century, so mansions in these areas, such as Holland House, cannot be considered as true historical townhouses. Bishops also had London residences, generally termed Palaces, listed below. 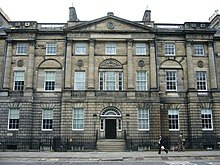 Many aristocratic townhouses were demolished or ceased to be used for residential purposes after the First World War. Berkeley's Inn, Baynard's Castle, City of London, town house of Thomas de Berkeley, 5th Baron Berkeley (1353-1417), which he gave in his will to Robert Knollis, a Citizen of London. The subsequent townhouse of the Berkeleys was on the site of Berkeley Square, which later became Devonshire House. Hertford House, Cannon Row, home of Edward Seymour, 1st Earl of Hertford (1539-1621), son of the first builder of Somerset House. The present Hertford House in Manchester Square, home of the Wallace Collection, was built by one of his very distant cousins. Wentworth House, 5, St James's Square, built in 1748-51 by William Wentworth, 2nd Earl of Strafford, to the design of Matthew Brettingham The Elder. in 1984 it was the Libyan "People's Bureau", gunshots from which caused the Murder of Yvonne Fletcher. Whilst most English examples of the townhouse occur in the capital, the provincial cities also contain some historical examples, for example Bampfylde House (destroyed in WW II) in Exeter, the county capital of Devon, the town house of Baron Poltimore of the Bampfylde family, whose main country seat was Poltimore House in Devon. Also in Exeter was Bedford House, also demolished, the town residence of the Duke of Bedford who resided principally at Woburn Abbey in Bedfordshire but required a base in the West Country from which to administer his vast estates there. 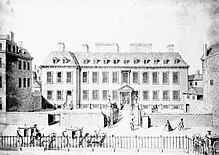 Leinster House, 18th century Dublin townhouse of the Duke of Leinster. It is now the seat of parliament. Leinster House in Dublin - residence of the Duke of Leinster (Ireland's premier duke) and now the seat of Oireachtas Éireann, the Irish parliament. Georgian Dublin consisted of five Georgian squares, which contained the townhouses of prominent peers. The squares were Merrion Square, St Stephen's Green, Fitzwilliam Square, Ruthland Square (now called Parnell Square) and Mountjoy Square. Many of the townhouses in these squares are now offices while some have been demolished. ^ For a description of an 18th-century town house in England, for example, see Olsen, Kirsten. Daily Life in 18th-Century England. Greenwood Publishing Group, 1999, pp. 84–85. Also see Stewart, Rachel. The Town House in Georgian London. Yale University Press for the Paul Mellon Centre for Studies in British Art, 2009. ^ For a general discussion of town houses in Edinburgh, see Brown, Keith M. Noble Society in Scotland: Wealth, Family and Culture from the Reformation to the Revolutions. Edinburgh University Press, 2004, p. 203ff. ^ For background, see Casey, Christine. The Eighteenth-Century Dublin Town House: Form, Function and Finance. Four Courts, 2010.